BBT Limited, managed by Arlette van Dijck and Bob van Heyst, has a team of more than 20 enthusiasts – each with their own speciality. With a range of products dedicated to rear wheel drive air cooled Volkswagens and Transporters, BBT is one of the biggest companies in the world in the Vintage VW parts business. With more than 300 suppliers and many more customers from Tokyo to Los Angeles, BBT delivers with their expanded network throughout the world. By visiting customers and suppliers and by attending meetings around the world, the company’s philosophy and passion stays true: to help the Volkswagen fans and/or users to find the desired parts in the quickest way and at the best price. Wolfsbürg West is probably the ultimate source for Volkswagen Beetle and Bus restoration parts. Their comprehensive inventory exceeds 5000 parts, making them the largest “stock” Volkswagen parts dealer in the world. Wolfsbürg West only carry parts for the Beetle and Bus. They are a direct importer of original parts from all over the world. Germany, Brazil and Mexico are all countries that they import from extensively. They are not only an importer, they’re also a producer and manufacturer of their own line of quality reproduction parts for the VW. Their focus is strictly on originality and therefore, they do not carry high performance parts or accessories that were not available for the period. Kaefer Nostalgie specialise in new and original parts for early Beetles with special focus on pre-1955 models. Their goal is to be able to offer their customers the widest range of parts for vintage VWs, a goal they have been following since they opened their doors in 2002. Since then, they have been adding several parts to their catalogue every month to become today the number one reference company when it comes to high quality parts for Split and Oval Window Beetles. Their inventory consists not only of carefully selected original parts but also of high quality reproductions which are only offered and manufactured by Kaefer Nostalgie. ZAR Werks is an internet resource for restorers of early Volkswagen Beetles. It is the brainchild of a couple vintage VW enthusiasts who possess various skills and materials and endeavor to fill voids in the hobby, making parts and services available that are not already available elsewhere. Accuracy and quality are everything. The products and services provided are worthy of the very best restoration. ZAR Werks is not a storefront, nor a commercial business. It is merely a hobby business that is run collectively by a couple of enthusiasts. Each one of these people represent a subset of the products and services listed on their website, and each one is wholly responsible for the sale, delivery and quality of that product. For that reason, the “purchase’ and “inquire” links under each product or service will open an e-mail window directed to the person who provides that part or service. STATUS VW PARTS have been around since 1998 and have become established as one of the leading names in the air-cooled VW scene. They’ve now become part of the VEWIB group – Their reputation for supplying the very best quality VW beetle parts is second to none with a range of standard original VW parts which covers VW Beetle models and all the other air-cooled models too. 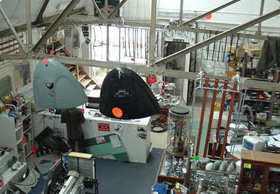 Their new premises, located on the outskirts of Rubgy in Warwickshire, features a showroom and mini museum located inside. Over the last 23 years Karmann Konnection has grown to become a leading supplier of restoration parts and accessories for Vintage Volkswagen, Porsche 356, and early 911 vehicles. They started back in 1982, restoring Karmann Ghias and Beetles at Ritchies house. A retail shop was opened soon afterwards to supply the rapidly expanding cal-look market. 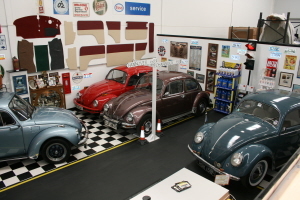 Their aim is to help you restore and maintain your pride and joy from ’40 s models to the last aircooled T25’s. Their knowledgeable staff are there 7 days a week to serve you. They also have a stand at all the major VW events in the UK. The new larger store and museum is in Southend, Essex just off the A127 and they have massive stocks of parts and vehicles including approx 15 Split Screen and Bay Window campers, along with a selection of Porsche 356’s for sale.